Hair spray powered by air and not greenhouse gases. Looking for something light that doesn’t hold you down? Our unique hair spray, infused with Coconut Milk, helps you forget the frizz for a flexible and sleek finish. Blended with the spirit of White Jasmine to keep your locks fresh and fragrant. This hair spray is also 94% Naturally Derived and cruelty-free, paraben-free, & alcohol-free. Read our Naturally Derived Page to find out more. Show frizzy hair a little TLC. Our Coconut Milk and White Jasmine Light Hold & Frizz Control Hair Spray helps provide long-lasting style while fighting frizz and flyaways. This hairspray is powered by air, not greenhouse gases - Yay! Giving a little love to the planet. Frizz-free hair has never felt so good. Found swaying high in the warm, humid skies of tropical islands like the Philippines, Hawaii and Polynesia, Coconut Milk comes from the sweet, nutrient-rich kernel of the coconut. 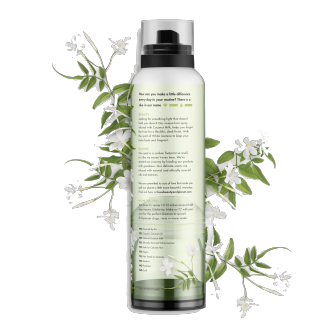 This hair spray combines the goodness of Coconut Milk with a burst of ethically sourced infused Jasmine. Hailing from Egypt, Jasmine exudes an intensely floral, warm, and decadent scent. • You know it—spray 10-12 inches away to hold your tresses. • Stylist tip: Make an “L” with your arm for the perfect distance to spray! •  If dispenser clogs, rinse in warm water. Our hair styling products, infused with Coconut Milk and floral clouds of White Jasmine, keep your hair looking its best! Found swaying high in the warm, humid skies of tropical islands like the Philippines, Hawaii and Polynesia, natural Coconut Milk comes from the sweet, nutrient-rich kernel of the coconut, and we’re just obsessed with it. Known to restore, repair and moisturize, this heavenly ingredient is the wonder-working elixir your parched skin and hair has been calling out for. light hold & frizz control coconut milk & white jasmine hair spray is rated 4.4 out of 5 by 124. 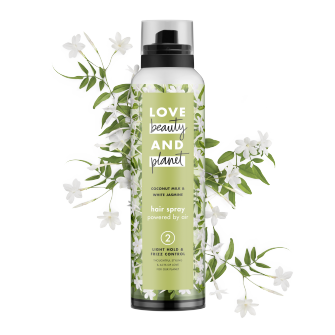 Rated 5 out of 5 by marmara1 from Love Beauty and Planet has been one of my favorite new brands lately and theyre really lookin out because it just so happened that Ive been looking for a light hair spray that really keeps my curls looking naturally wavy throughout the day. This product has actually increased the life on those natural curls! One of my favorite things about this product is THE SMELL. So, I freaking love my Filipina heritage. This hairspray feels like water, keeps my Filipina hair wavy longer, AND IT SMELLS LIKE SAMPAGUITA (white jasmine), which is the national flower of the Philippines. Its everything I want, and I know Ill be repurchasing this product once I run out! Rated 4 out of 5 by hannahab09b from I recieved this product from Influenster for reviewing purposes only. All thoughts and opinions are my own. I have fine and thin hair that is very unruly with tons of baby hairs. I really love how environmentally friendly this product is and the fact that it is cruelty free. I really enjoy the scent of this hair spray that it doesn't choke me to death. It has a good amount of hold without giving ky hair white flakes the next day. The only drawback is that I wish the spray was a little more forceful or power to it as it feels more like a setting spray. It could just need to be something that I need to get used to though. Rated 3 out of 5 by vanessaa7c83 from I received this to try in my VoxBox, at no cost. I was thrilled to try it, since it's a really cute and generous sized hairspray. It has a mild botanical scent, somewhat more greens (think leaves and grass) than florals. I used this to tame stray hairs when I put up my ponytail, and it held on for a while, but the hold truly is super light. With a bit of drizzle (thanks to the weather), my hairs were no longer in place. I did find it works well with loose curls, to keep them looking natural and in place. Hair can feel like straw if this product is overapplied. I love that it's not non-aerosol. It's a decent product, but I wouldn't suggest it for elaborate hair styles. Rated 3 out of 5 by aileenh1 from I received this product for free. All opinions expressed are all my own Smell: Smells good, for me its nothing special but its not bad as well. For the price: Very affordable for the amount that you are getting. The Hold: It is just a typical hair spray as well, it holds well but I prefer a soft hold that I am able to brush my fingers through. It doesnt do that with this. I waited a while to do this review so I could really test the product many times. The bottle: the spray nozzle got clogged easy ;took me a while to unclog it. It worked after a lot of tries . Overall thoughts: Its an Ok product. Rated 4 out of 5 by jllf1991 from This was the complimentary product I received in my first Vox Box and I couldn't be any happier with it. This product is completely vegan and cruelty-free. It's also "air powered" instead of it using aerosol, which I thought was pretty cool. It sprays out very lightly so you don't have to worry about using too much product. It's a very light hold hairspray, but it's perfect to tame your fly-aways. I also love the way it smells. The scent is coconut milk and white jasmine, and it's not overpowering like coconut can sometimes get. I think this hairspray is definitely worth checking out, especially if you're into more natural products. And even if you're not, it's still a good hair spray!